In early 2016, we launched our newest product division that focuses on the manufacturing of teardrop trailers. We have applied our past experience in building RVs and living quarters in large trailers to the design and construction of the PeeWee teardrop camper models. Installing power, water, cabinetry, wall panels, and all the other amenities that we include in the PeeWee teardrop camper is no different in nature from the build-out in a large trailer. We just make everything fit in a much smaller area. Maybe it's just the challenge of making “the smallest,” but over the years, we have made some really small automotive products. 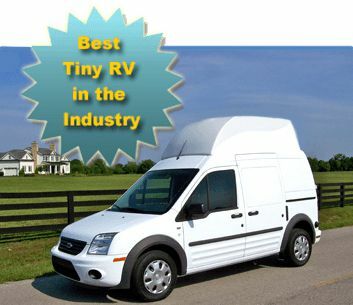 One of the camper models in the small category was called the Pint Size. It was packed with amenities and even had a full-size, stand-up shower. This model was put on hold while we tooled up in favor of producing larger numbers of our smaller teardrops. Now that all the teardrop production lines are running smoothly, we are bringing back the Pint Size model (reconfigured as Big Brother). Another product in the small category was the “Lil Tripper,” built inside the Ford Transit Connect miniature van. It was one of the smallest, full-amenities RVs ever built. With only an inside footprint of 4' by 6', the Lil Tripper still provided two people with beds, a couch, a TV, a table, a refrigerator and microwave, kitchen cabinets with a sink, a flush toilet, and a full, stand-up shower - and we don't mean a marine shower either! Although this was a great little RV, we felt our expertise was better suited to building tag-along campers instead of motorized RVs. All the vendor trailers that we have built in the past would represent the “big” category — and by big, we mean 40+ feet long. The vendor trailer in this photo is 44 feet long. 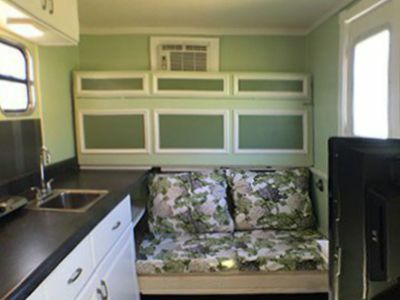 The living area at the front of the trailer has heat and AC, a full kitchen and a full bathroom with full-sized vanity, sink, flush toilet, and stand-up shower. The gooseneck area houses a king-size bed, TV, and other amenities. 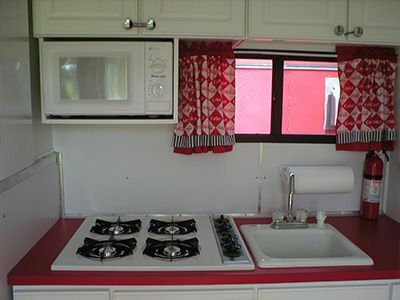 The kitchen area, with Coca Cola theme, has a four-burner built-in propane cook-top, kitchen sink with soap dispenser, built-in microwave oven, a refrigerator, and lots of storage with overhead cabinets and base cabinets with plenty of drawers. 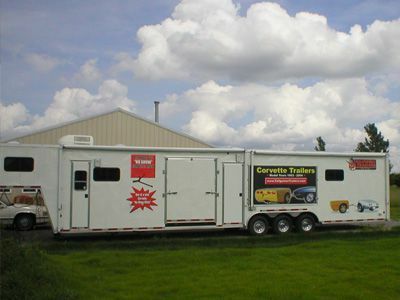 The 46-foot gooseneck trailer, shown on the right side, is another example of the trailers we produced for vendors. 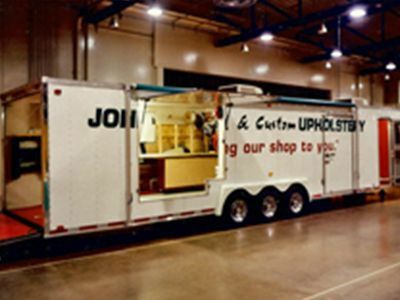 This trailer is a mobile upholstery shop that features every conceivable item needed to do a custom car interior at a customer's location. Like a camper, this trailer had all the electrical power on-board and was totally self-sufficient. At PeeWee Campers, we combined our love for the small and our expertise in the unique, and came up with the “Tailgunner Trailer,” a tag-along, fiberglass Corvette trailer, unlike any other trailers in the country. These trailers were not made from actual Corvette rear-clips, as they might appear. Although these trailers are no longer in production, they show the creativeness and versatility of our designers and production staff. 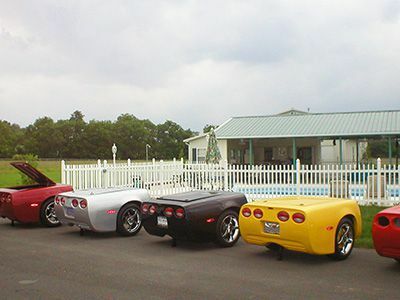 We designed these trailers along the lines of the Corvette rear end, but we had our own fiberglass molds made for them. They were about 80% the size of an actual Corvette rear end. Light-weight and easily moved by hand, the Tailgunner Trailer could hold an unbelievable amount in its carpeted cargo hold, which had a locking trunk lid with hydraulic shocks that held the lid open. Not only do we manufacture products that are distributed in the US, we have also distributed our products internationally. We manufactured this electric car so it would make virtually no noise, go no faster than 15 miles an hour, have the torque to go up and down steep Alpine streets, and would run on a single charge for an entire day. It had to conform to very exacting Swiss regulations regarding top speed, size, shape, safety equipment, etc. It's powered by 48 deep-cell batteries. The Pint Size, no longer in production, is large enough to stand up in. 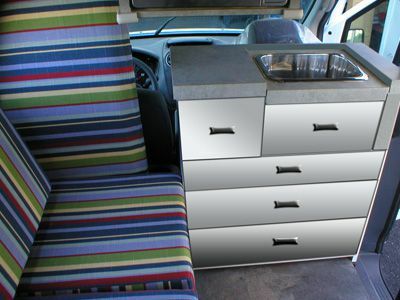 The 6x10x7-foot camper sleeps two, has a kitchen, toilet, and stand-up shower. The Lil Tripper, also no longer in production, had an unbelievable number of amenities in a tiny, tiny space - including a stand-up shower! Here you can see the kitchen cabinet with sink just behind the passenger seat. On the left is the couch that converts to the lower bunk bed. This self-sufficient “mobile” automotive upholstery shop supplied all its own electrical power to run its equipment. This is a Coca Cola themed kitchen we did for a customer in one of our large 44' vendor trailers. This fiberglass, pull-behind trailer was 85% the size of a real Corvette. We still get requests for this trailer occasionally, but it is not in production any more. 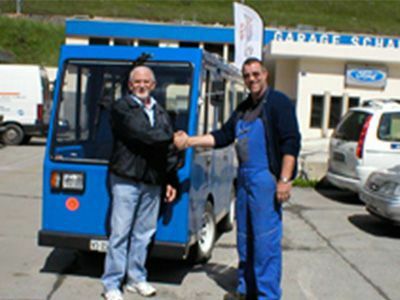 Our "designer-in-chief" delivering the electric car he designed for car-free Alpine villages to our distributer in Switzerland.